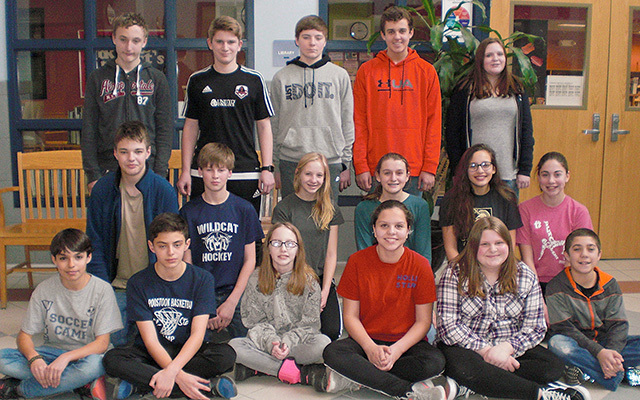 Presque Isle Middle School recently celebrated the Students of the Month for February. From left are, back row, grade 8: Jacob Deschenes, Jonah Roy, Xavier McAtee, Matthew Hedrich and Madison Ward. Middle row, grade 7: Garrett Fullen, Jonathan Staples, Astrid Newton, Mia Casavant, Isabella Keegan and Olivia Kohlbacher. Front row, grade 6: Ayden Cunningham, Wyatt Young, Emma Murchison, Rylee Crowe, Lexie Theriault and Caleb Green. Missing from photo is Kiley Howlett, grade 8.